Though little consolation, Assad has acknowledged that when his army killed demonstrators in Daraa in the beginning of the uprisings, the regime had made a significant error. It is worth wondering whether Bashar Al-Assad had thought that squashing the protests would be as easy as his father, Hafez Al-Assad, had demonstrated in previous eras. Assad’s tactics indicate that he borrowed lessons from his father, whom in 1982, both brutally and successfully, ended a rebellion in Hama. In the process of ending said rebellion, he had slaughtered an estimated 14,000 people, many of whom were women and children. Bashar must have thought, and might still think, that the current conflict could be violently quelled just as quickly. But that has not happened, and the noteworthy fact that those killed in Hama in 1982 were predominantly Sunni, reveals interesting dimensions about the ongoing predicament; the children of Hama in 1982 were likely raised on the tales of Assad senior’s massacre, and, it would seem, have grown up to become segments of the rebellion we are all witnessing today. Decades later, it is easy to see manifestations of the effect that the Hama massacre has had. However, the crisis is so much more than the vengeance of Syrian Sunnis. It has also evolved into a much larger geopolitical proxy-war between Gulf Sunni monarchies, their western sponsors, and what is now referred to as the Syria-Hezbollah- Iran axis, with Iran still being the salient target. Qatar has made it clear that it thinks the Syrian rebels should be armed, and has provided assistance to the rebels. The U.S. and its western allies have a similar agenda. Small numbers of CIA operators are already in southern Turkey assisting rebels with logistics, and coordinating arms delivery into Syria. The prospect of a regime change in Syria offers a unique chance to isolate Iran from one of its few Arab allies, and in the process would deal a powerful blow to Hezbollah. Hezbollah itself, has already faced turmoil and resentment at home in Lebanon for its continued support, and justification, of Assad’s violence. But just how dirty the U.S. is willing to get its hand, remains unclear. And as the conflict continues to rage on, it seems more and more unlikely that the U.S. will directly intervene. Unfortunately, the proxy-war aspect of the Syrian conflict continues to eclipse the often neglected, and crucial point, that the uprisings developed locally, and organically. It is commonly argued by self-proclaimed anti-imperialists that the uprisings are now nothing more than an extension of western foreign policy. But such assertions neglect the inconvenient fact that the revolution inside Syria is still largely being carried out by Syrians. There are elements of Al-Qaeda in eastern Syria, and other foreign fighters but their presence has not been substantiated as being more then minimal. 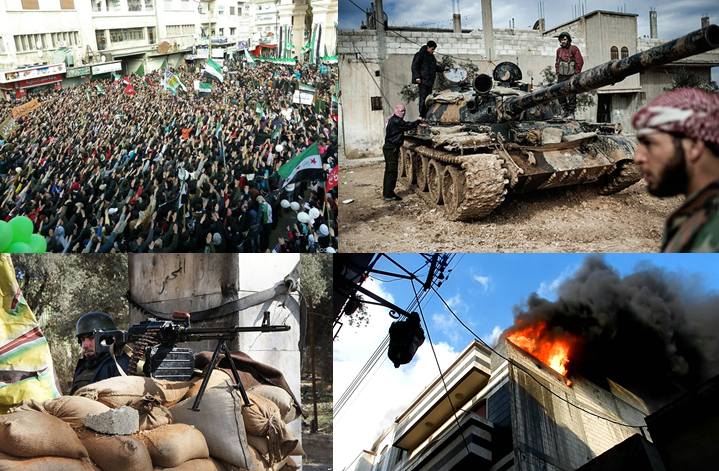 Syria is now undergoing a civil war, and of that we can be certain. There are still pockets of Syrians who support the regime, mostly Alawites, other small pockets of minorities, and upper-class elites, who fear that what might follow Assad could be worse. But high-ranking deflections, such as Manaf Tlass and others, prove that the revolution still has its roots in Syria, and is not being imported from the outside. There are still demonstrations organized by local community members, and it is hard to argue that they would be putting their lives in very real danger if they did not believe what they were doing was for their motherland. Foreign interests will always be present in any revolution. Have we forgotten Libya? Or the general western blindness towards the brutal squashing of the Bahraini uprisings? But the agendas of foreign powers always comes second to the will of the native people, and to argue against revolution simply because it is coated in vested interests is to argue against all revolutions. It is unclear of what will follow the Assad era, but progress will never be achieved by stunting the natural resistance of the majority of the Syrian people.